In a recent Facility Cleaning Decisions survey, 84 percent of in-house cleaning managers rated performance, quality, and durability as the most important considerations when purchasing products and equipment. When it comes to floor care, this is no surprise. According to advisory board members from "Sanitary Maintenance" sister publications Facility Cleaning Decisions and Contracting Profits, maintaining floors is time-consuming and labor-intensive, requiring a substantial investment in machinery to boost productivity. Both in-house facility managers and building service contractors favor machines that are easy to operate, and simplify or consolidate cleaning processes. Standardization is also a priority when purchasing equipment — as is distributor support — to facilitate training, maintenance and repairs. 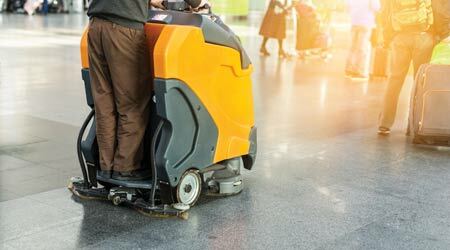 According to facility managers and BSCs, training staff in the proper use of floor equipment is one of their biggest challenges: Not only are custodians pressed for time, but turnover rates are high. In addition to buying machines that are easy to operate and maintain, BSCs and facility cleaning managers prefer to standardize floor equipment across the board. Doreen Bessert, building services supervisor for Manitowoc County Public Works in Manitowoc, Wisconsin, oversees custodial services for 10 government buildings. She says that it has taken her years to standardize her floor equipment. “Occasionally I have to pull staff from one building to another if someone is out sick or on vacation, so I want to make sure they know how to use that equipment,” she says. Similarly, Gene Woodard, director of building operations at the University of Washington in Seattle, relies on one manufacturer to standardize his equipment fleet, which includes ride-ons, walk-behinds, burnishers and restroom cleaning machines. “Standardization is really important for training purposes and familiarity with the different machines,” he says.